As luck would have it, the Challis Valley RV Resort changed hands about a year ago and the new owners are from Colorado. While I would rate the park as average, the friendliness and customer service we received from the owners gets 5 stars. They could not have been more accommodating or helpful. They pointed us in the direction of the Pizza Shoppe for some very good pizza - yes, even in the middle of Idaho. They also gave us some great suggestions for day trips and what follows is the one we decided to take. 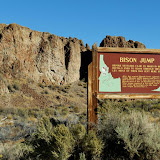 Using maps and guidebooks borrowed from Frank and Nichole (the RV park owners) we headed south from Challis to Route 75 and turned west on what is a continuation of the Salmon River Scenic Byway we blogged about yesterday. Our first stop was the well preserved ghost town of Bayhorse in Custer County, Idaho. It was founded in 1877 and after a new gold mine failed, silver was discovered in the area and a new mine was started and at one time housed over 300 residents. If only the buildings could talk! Moving on we went through Clayton, Idaho – which boasts a population of 7…yes 7 according to the 2010 Census! A cute place, but since we are travelling out of season, the “historic sites” were closed. Still we wandered around a bit reading some of the postings describing the mining history of the surrounding area. We continued west on 75. As we rounded a bend an amazing thing happened! This huge bird almost flew into our windshield. We stopped, and there we were eye-to-eye with a Golden Eagle. We weren’t exactly sure what happened, and apparently neither was he! He had come down for a road kill meal, and was totally focused on it. After a few seconds, he came to his senses and flew away. We were able to get a few photos of him in flight. That will be a “memory maker” for sure! The trip along the Salmon River was filled with amazing vistas. As we entered Stanley we stopped for this shot. Photographs can never do justice to such a magnificent view - but this was our attempt at capturing it. Stanley sits in a magnificent valley but it is also home to the record for the coldest temperature ever recorded in Idaho, -50 degrees Fahrenheit. Probably not a place we would want to be in the middle of winter. Our next stop was Redfish Lake and Redfish Lake Lodge - just in time for lunch! Refueled, we got back on 75, which taking us south toward Ketchum and Sun Valley. As we climbed up Galena Summit we were treated to some amazing vistas of the Sawtooth Wilderness - all breathtaking. As many of you know, JoAnne is a genealogy addict (her words not mine). She is fascinated with family histories which many times take us to remote and/or historical cemeteries. Our trip today to the Ketchum cemetery was special, as it is where Ernest Hemingway is buried - Pretty interesting even if you are not a genealogy addict. From the middle of Ketchum we turned back east on Sun Valley road toward 93. It is about a 41 mile leg of the trip - but the notable part is a 4 mile stretch of dirt road that clings to the mountainside with some pretty good drop-offs. While a jeep would have been better suited for the trip we went slow (sometimes very slow) in our little Honda Fit. Now back on 93 we headed north toward Challis. Stop! What was that sign we just flew past? Going back to check it out we learned that we were traveling along a fault that had been exposed during the 1983 Borah Peak Earthquake. It was a 7.3 quake and caused Mount Borah (Idaho's highest peak) to lift 1.5 feet and the valley floor sunk about 5 feet. We were able to drive back a couple of miles and see the fault up close. Now sufficiently hungry we headed back "home" to eat leftover Pizza and watch the Presidential debate. Click below for more photos of our journey.